Has anyone seen or sailed against a DUMA 16? Are they fast? In the specs it's got carbon hulls and mast, but it weighs 296lbs. two up. Is that right? Sounds a bit heavy? I couldn't find any You Tube videos of it, are there any actually sailing yet? The Duma popped up on my radar late last year when photos of the boats were being shared on facebook. very trendy paintwork! That's a lot of carbon! Kinda looks like a new company. you are going to need a couple more bags of cement to make min weight for F18! Look at you doing google searches, I think I'm actually getting a little choked up. You have come so far Tim this is a proud day for all of us. "You don't have to be a brain surgeon to be a complete idiot, but it helps"
We are a new company and the Duma16 is our first production boat. We believe that shes fast but its up to us to prove it to the public. On paper 130kg for a fully carbon fibre F16 does look a lot but in reality with our design its not. You would need to see the boat in real life to fully appreciate the increased hull volume compared to other F16's, the lack of performance gain from being sub 120kg and our aim to build a boat that wouldn't fall apart on our customers were the reasons behind this target weight. We feel that we could go lighter with the overall weight but didn't want to publicise a weight that we could never hit for the sake of fooling people into buying our boat. Last edited by Duma Cats; 08/13/14 06:21 PM. with all due respect a Viper with glass hulls, ali beams and mast weighs 129kg and doesn't full apart. If you can't do better than that with Carbon then you need new engineers. I would say we have at least 30% more hull volume than the Viper. The Viper is a fantastic, well built boat and the benchmark for all F16's, but we chose not to go lighter as we feel the 125kg-130kg range is optimum on the schrs handicap rating system we use in the UK. look at the Falcons, originally they were under 120kg now they have crept up to the 125kg-130kg range. Nice looking boat Duma. If its as fast as it looks its a winner. I haven't seen any weights of the Falcons lately, but they are still the lightest of the what we have available in the U.S. for commercially built F16's, (other than the original Blade). The Viper has gotten a bit lighter from the original I'm told. Small changes in layup, I guess they took some weight out with a lighter gelcoat, or less of it. All in all, I think the Viper has shed close to 10lbs (4-5kgs) from when it was originally released. I've taken about 7lbs, (3kgs) out of mine by putting carbon rudder stocks, tiller crossbar, boom, and spinnaker pole on. Plus whatever weight I ditch rigging the boat uni and not having a jib and associated hardware. But, that all came at a cost too. prior to designing the Duma i had a chat with the top Viper sailors in the UK and asked if you could improve the Viper what would it be? And more volume in the Bow was the only real request. I took that and added it to my personal key design features of wanting a aggressively high beam placement and high displacement flat bottom to help carry the weight of heavier crew weights like myself. the high beam placement is to prevent beams crashing in to small sharp chop, something i experienced when sailing a spitfire and found really frustrating. So these key features cumilate to a boat with a lot more volume and hull area, the drawback is more carbon and more weight. How does the pricing compare with the viper and falcon f16s? it would have to be considerably more? I know the Falcons added a bit of weight to the fiberglass versions because of the handicap penalty they were being hit with for a lot of the big races in Europe. Teams were winning races but not making the podium because of handicap differences with not all the F16 signing up as an F16. You have Bimare, Raptor, and Falcon who all make a min weight carbon version if someone wants to go that rout. A full carbon boat weighing even more than the glass versions might be a tough road to try and go down. Not meaning to bash. - Congrats on the launch. 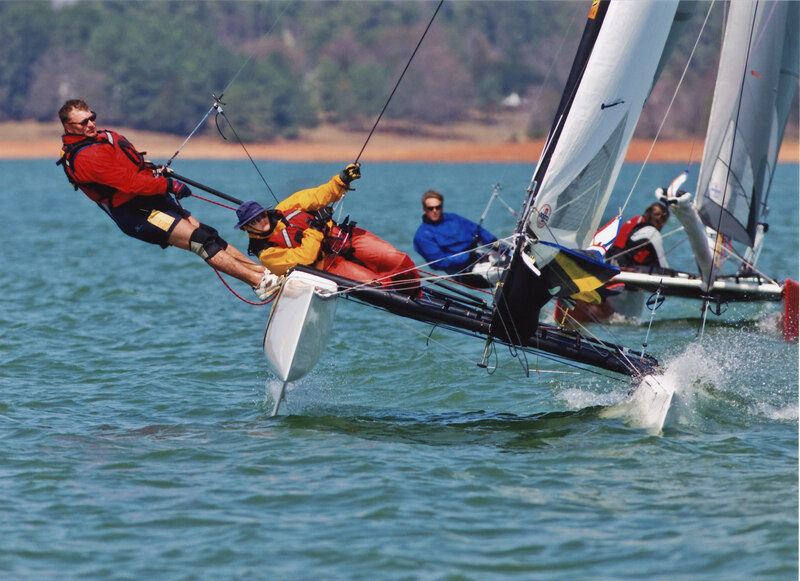 Gatting a boat to the first event and especially a major one can be quite an undertaking. And look at you, old man in a white van, trolling the F16 playground again! Isn't there a better place for you to spend your time? What are some features and reasons to purchase a Duma? Everyone is always interested in hearing about a new design. The Nacra F16 is all carbon/epoxy construction, not sure about weight.